Whether you’re celebrating 4th of July or marking Memorial Day, these patriotic recipes will make your table shine and your bellies happy. Are you gearing up for a big Fourth of July like I am? Then you’re going to want to make this eye-pleasing patriotic mousse parfait recipe in the best colors around — red, white and blue! Try this simple but delightful snack mix that will be a huge hit with kids of all ages. 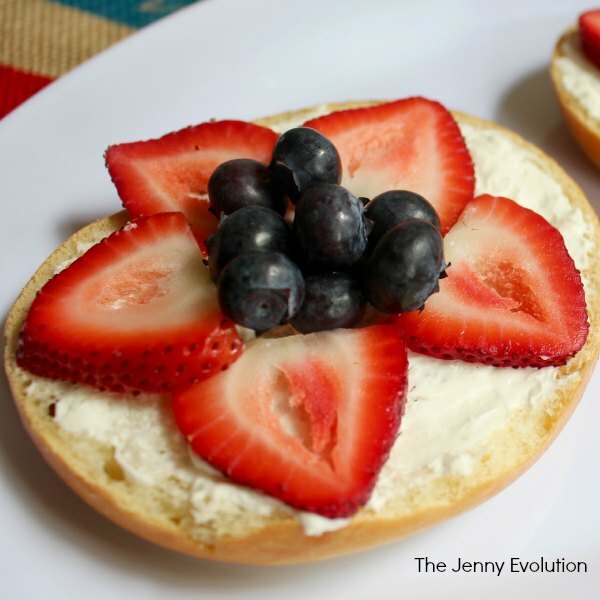 This 4th of July breakfast bagel recipe is so simple, yet very pretty for a holiday display! And it’s easy for the kids to make, too! These yogurt parfaits so ridiculously simple and easy to make, but pack a seriously festive punch for Independence Day! These decorative easy mini berry tarts are low in sugar and she can enjoy just one or two without having too many. The mini muffin tin is a perfect size. Whip up these easy patriotic cupcakes with a surprise in the middle, which are sure to be a hit! A distinctly red, white and blue box of spiral sparkler and flag cookies look just as marvelous as they taste. You’ll have no leftovers of these delicious and decadent 4th of July cake pops at your cook out! 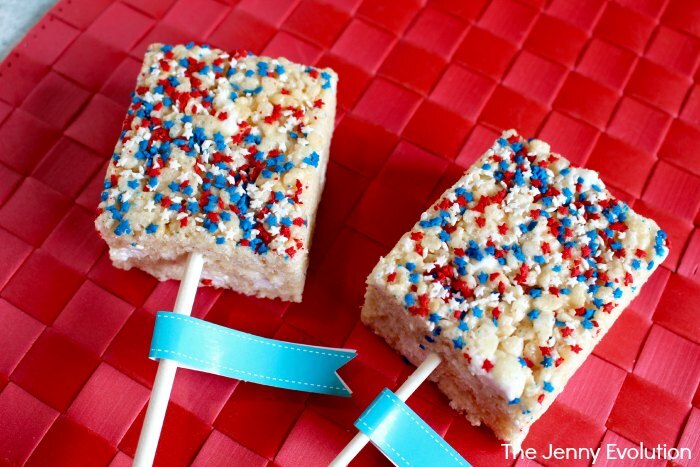 These desert safe cookie and brownie crunch treats are in honor of our military heroes past and present. 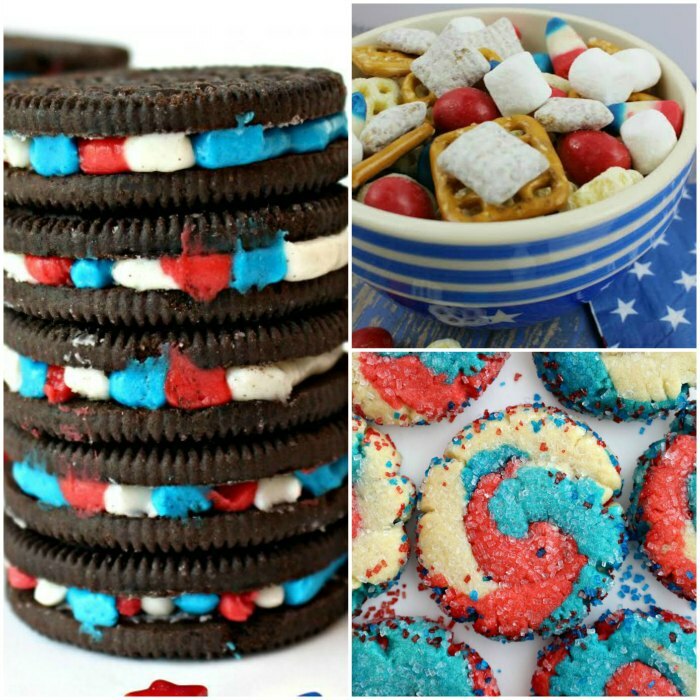 They are great for a patriotic celebration or for care package sharing. Even though it’s been almost a year, this baker’s kids are still talking about how they hope grandma will make the firework bundt cake for the next Fourth Of July. This red white and blue Jello parfait is unbelievably easy and won’t break the budget. Looking for a fun 4th of July party appetizer? This neat idea for fruit kabobs will do the trick. No bake cheesecake topped with berries in a pretzel crust that is shaped into a cup! It’s a delicious, light and easy dessert that’s diet friendly too thanks to a secret substitution. These “patriotic” waffles are a great combo of fruit, waffle, and tasty whipped cream – definitely fun and simple to make. This red white & blue M&M’s cookie tart is unbelievably easy, tastes great and serves more people than you’d think. Here is an easy mini fruit tart recipe that you can make for summer parties. The red, white, and blue colors of these tarts make them perfect for the 4th of July or Memorial Day. A fun and festive star cookie treat.. this delicious vanilla dough and accompanying vanilla frosting recipe will have your friends and family gobbling up these tasty homemade star cookies! Surprise-inside brownies are an absolute delight from the very first bite! Yummy patriotic pinwheel cookies look complicated to everyone else, but you know that really it was just a matter of dyeing the colors and rolling them out separately to create the colorful effect. 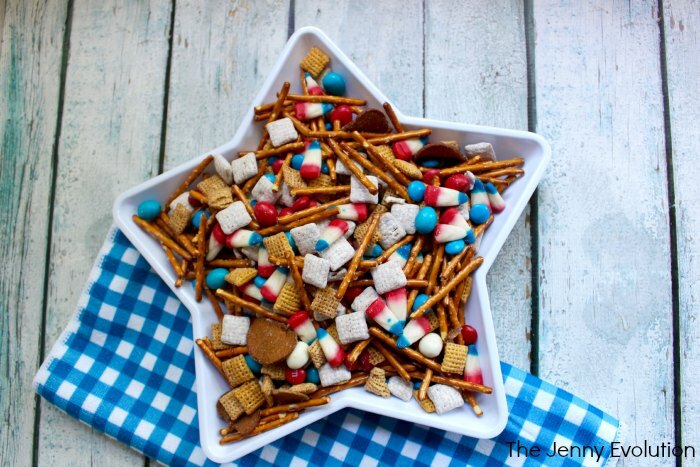 Patriotic snack mix will satisfy both your savory and sweet tooth! This red, white and blue fruit salad will be perfect for any day or July 4th celebrations. Red strawberries, red raspberries, and white apples all mixed with a yummy lime dressing. This is a red white blue patriotic trifle– it is so cute and really tasty! 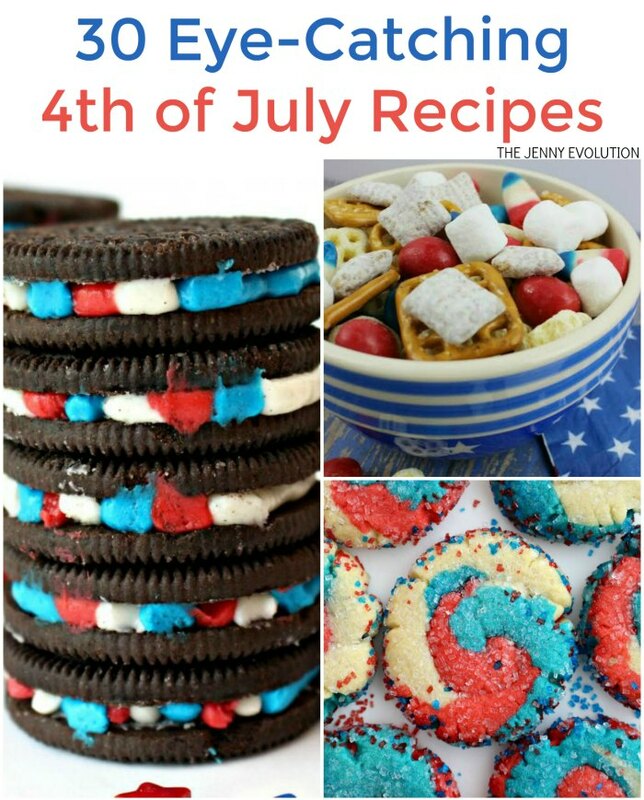 Red white and blue bites, are really pretty quick and easy to whip up. The only part that takes time is the Jello setting up. Firecracker pretzels is an easy way to add a sweet touch to any gathering. Since fireworks are such a patriotic way to display our love for our country, patriotic surprise firework cupcakes are perfect. 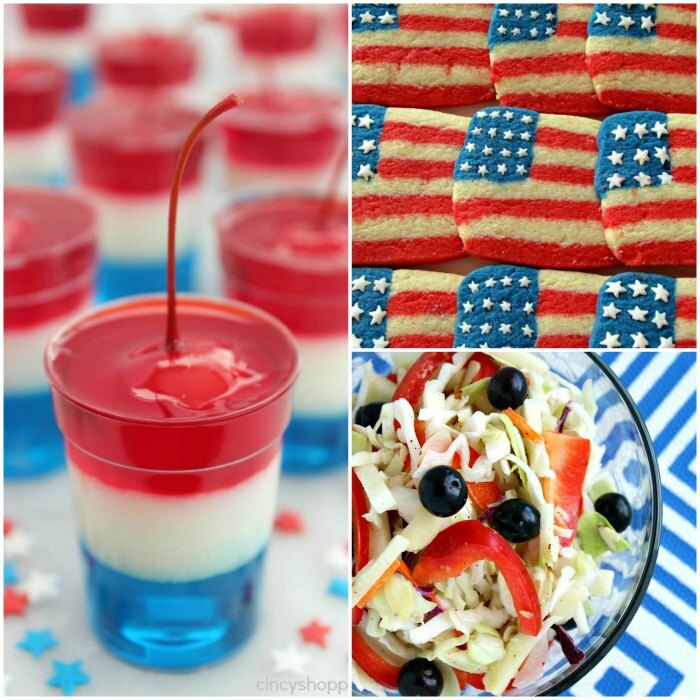 This fun and patriotic red, white, and blue slaw salad is exactly what your BBQ needs! Let’s hear it for the red, white and blue with this fresh fruit salad drizzled with honey poppy seed dressing! It’s worthy of any celebration! Here’s a chocolate covered Oreos recipe perfect for summer gatherings. The festive red, white, and blue is ideal for Memorial Day or 4th of July parties, but works for all year, too. Find 100s of more delicious recipes the whole family will enjoy on Mommy Evolution! What a delightful collection of Patriotic recipes. Your pictures are wonderful and there is such an awesome selection of recipes to choose from. Shared and Pinned. Thank you for sharing at Tasty Tuesdays link party. Hooray for the red, white and blue!! Thank you for sharing at What’d You Do This Weekend? Hope to see you back next week! Love the recipes you picked especially the trail mix! This is a great round up and I can’t wait to make those chocolate sandwich cookies. What a very special collection, I pinning this one! Your post is awesome and thanks so much for sharing it with us at Full Plate Thursday. Hope you are having a great day and come back to see us real soon! I tried pinning and it says your site won’t allow it to be pinned, I tried several times.